I discovered this brand several years ago when I purchased my first pair of platform leopard print wedges. They have stood the test of time and I still wear them today. Well not today because it's currently snowing, yay! Brooklyn based brand Kelsi Dagger evokes smart street style, edgy and urban yet totally wearable, this is a shoe brand that is always on our radar. KD prides themselves in creating pieces with a heritage soul and a modern edge. I love the classic meets modern element, I can always count on KD shoes to elevate my style. Stacked heel bootie - Suede bootie with croc-embossing, zips in the back and a stacked heel. These booties have gotten a lot of wear, from big dresses, to my culottes to skirts, to skinny jeans. I love the modern easy style. 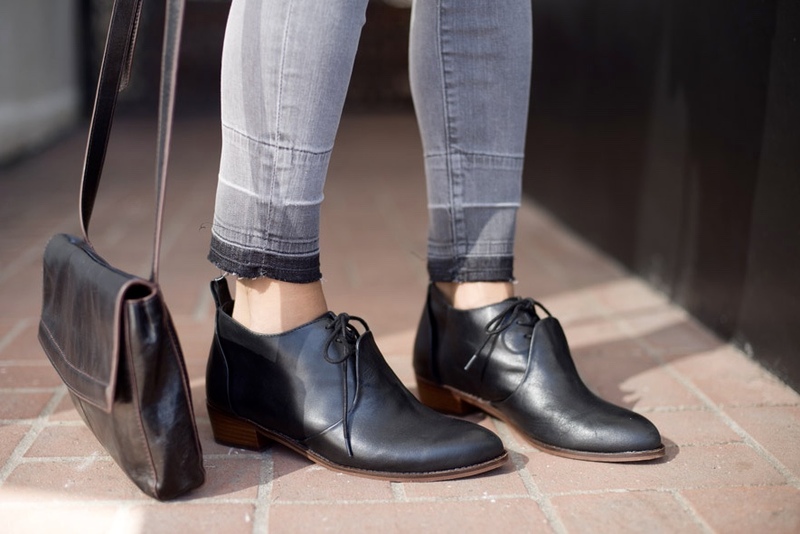 Court Oxford - this shoe is the best of all worlds with it's menswear-inspired oxford style, adding just a bit of an 1.5 inch heel that keeps it feminine and an extra bit flattering, and the subtle nod to a great bootie with the leather front detail to seal the deal. These shoes are for sure rad. 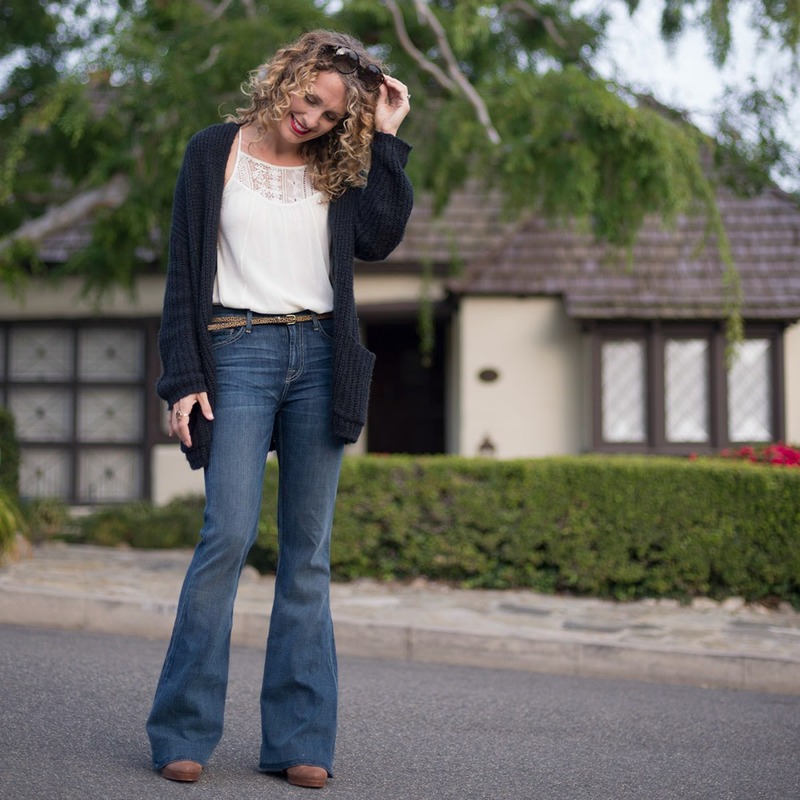 They are a great alternative to booties or sneakers to wear with all my skinny jeans. Outfit #3 - I am loving the platform/clog/Mary Jane style of these hybrid heels. Perfect when paired with this seasons flared silhouettes (especially when showing some skin with this cropped pair). I've also worn them with opaque tights and a sweater dress, even leggings and a tunic...the possibilities are endless. And, although a high heel, the platform makes them comfortable enough for everyday wear; making them stylish and realistic. And, right now, on major sale! A win, win...win! Outfit #4 - Loafers are my current obsession this season! I love the menswear-inspired styling but with unique detailing that make them a beautiful, feminine shoe. Simple with skinny jeans and an oversized sweater, classic with a tucked-in blouse, and so easy to dress-up with trousers (like here). My other obsession is a pleated midi-skirt (found here)...these shoes will perfectly translate a skirt into daytime wear. And did I mention comfortable? A slight wedge gives these flats a little lift and makes them completely wearable.